Upasaka Dharmatala (Skt. Upāsaka Dharmatāla; Tib. དགེ་བསྙེན་དྷརྨ་ཏ་ལ་, Gényen Dharmatala, Wyl. 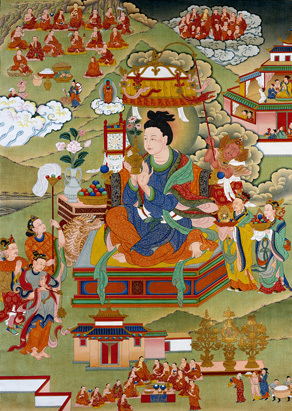 dge bsnyen d+harma ta la ) — a patron of the Dharma, attendant of the Sixteen Arhats and a manifestation of Avalokiteshvara. After the Buddha's parinirvana he consoled the lay followers and patrons of the Buddha assuring them the Dharma would be preserved and encouraging them to strive for the highest perfection. He has great wisdom, spiritual powers and skills; greatly learned he carries the scriptures on his back. He carries a fly whisk and a water flask symbolizing his service to the arhats. He has a tiger at his side, to protect the Sixteen Arhats from dangerous animals. Every day he turns to Buddha Amitabha for guidance.